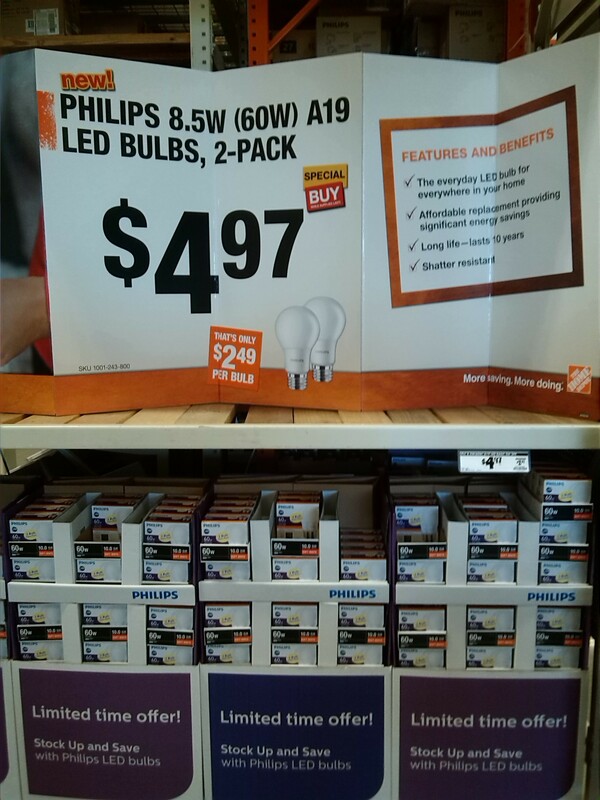 This morning I walked into Home Depot and first thing when I walked in the door I was staring at this display offering 2 60W equivalent LED bulbs for $4.97. This is an amazing deal for anyone looking to convert over to LED bulbs. I switched to LED last year and have been saving $20 a month on my electric bill because of it and will continue to save $20 a month, every month, for the next 20 years. One very cool detail lost in the sale is that the advertisement states the 2 pack of bulbs is half off. 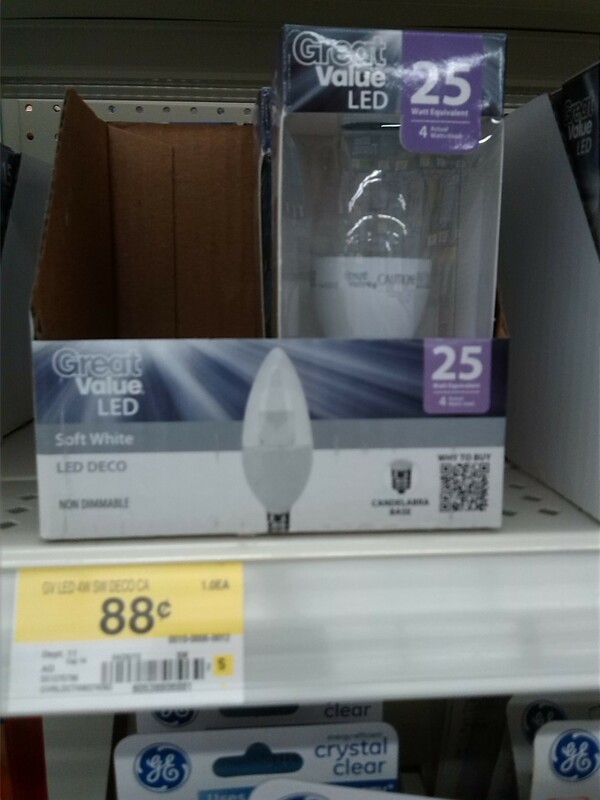 If this is the case, the normal retail price will be $10 for a 2 pack, which will drive the normal retail price of 60W LED bulbs down to $5 a piece. A year ago the normal price was $10 each, recently it has been $8 each and now they are falling even further. 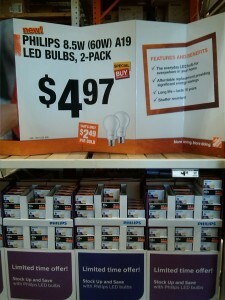 I looked around Home Depot and also came across the Cree bulbs, both 40W and 60W LED bulbs were priced at $4.97 each. These are normally $9 each and since they come with a 10 year warranty are preferred by many consumers. 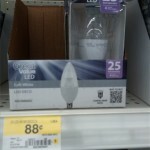 After leaving Home Depot I headed to Wal-Mart, which is where I acquired the majority of my LED bulbs. 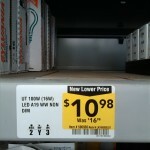 They were out of stock, but their 60W LED bulbs were priced at $3.96. They still have the 65W flood lights for $5 each, and they dropped the price on the 25 Watt candelabra lights to .88 cents. Since Lowe’s is right next door, I popped into Lowe’s to check out their LED bulbs. They had the 40W LEDs on sale for $2.48 each, but I could not find any 60W bulbs. 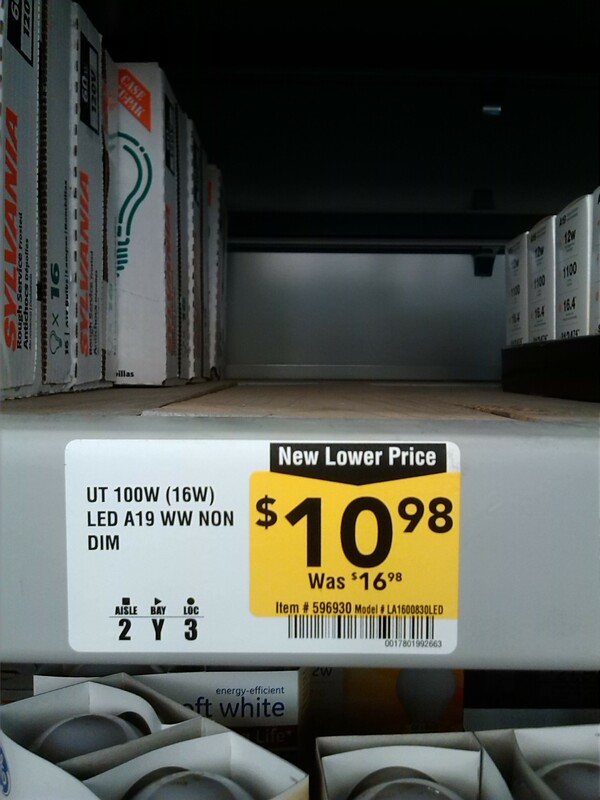 The big savings I found was on their 100W LED bulbs, which are now $11, and their 75W bulbs which are at $9. This is about half the price of what they had been selling for a year ago. The 100W LED bulbs use only 16W and the 75W LED bulbs use only 12W. Although prices are on a downward trend, now is an excellent time to stock up on LED bulbs. The sale at Home Depot is only for this week, so I would grab as many as I could to switch over now while prices are under $3 a bulb. Replacing Incandescent and even CFL lighting with LEDs is a quick, easy, and now inexpensive way to lower your monthly utility costs. Have you switched over to LED bulbs yet? How much has it saved you on your electric bill? UPDATE: 8/29/2015: Amazon now has 4 Packs of Phillips Slim 60W Dimmable LED bulbs for $20 , making them $5 each. 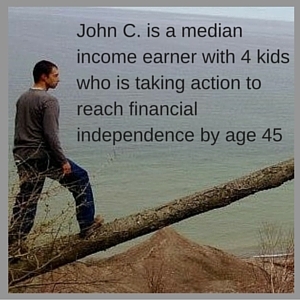 You can also buy in bulk and save even more, getting $25 for just over $100 making them $4.12 each. They also ship for free with Amazon Prime.